Expansionary monetary policy aims to increase aggregate demand and economic growth in the economy. Expansionary monetary policy involves cutting interest rates or increasing the money supply to boost economic activity. It could also be termed a ‘loosening of monetary policy’. It is the opposite of ‘tight’ monetary policy. 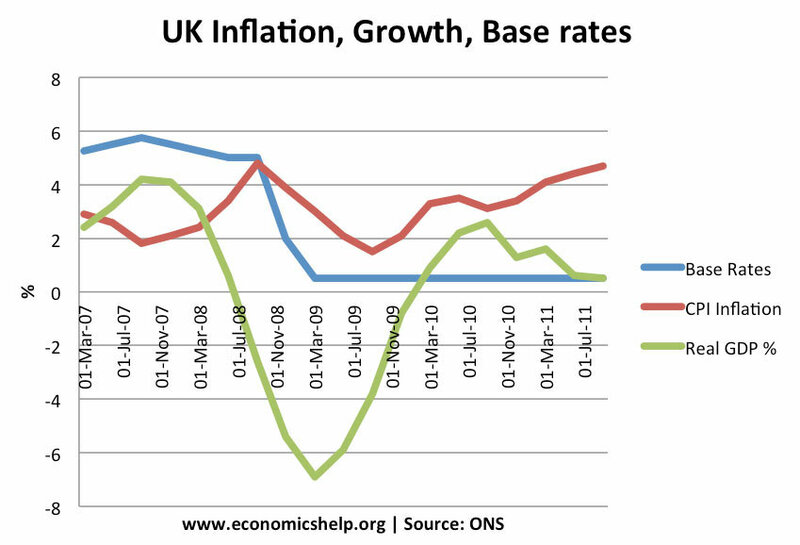 The MPC of the Bank of England has an inflation target of 2% +/-1. They also consider other economic objectives such as economic growth and unemployment. If inflation is forecast to fall below the target, they can consider loosening monetary policy to target higher inflation and enable a higher rate of economic growth. Also, if the economy is forecast to enter into a recession, they are likely to cut interest rates and try to boost economic growth. How does expansionary monetary policy work? If the Bank of England cuts interest rates, it will tend to increase overall demand in the economy. Lower interest rates make it cheaper to borrow; this encourages firms to invest and consumers to spend. 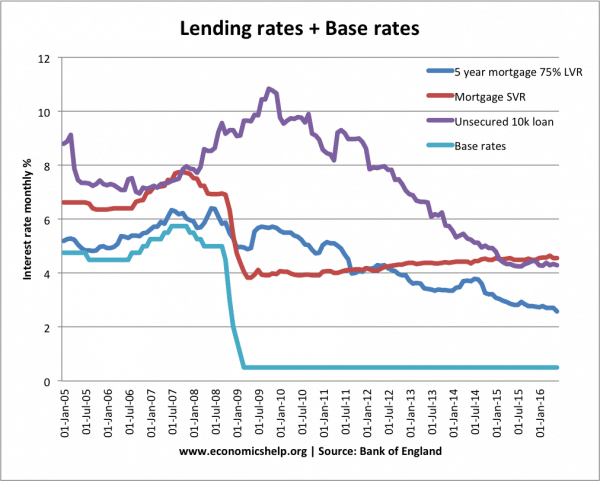 Lower interest rates reduce the cost of mortgage interest repayments. This gives households greater disposable income and encourages spending. Lower interest rates reduce the incentive to save. Lower interest rates reduce the value of the Pound, making exports cheaper and increase export demand. Increase the monetary base and cash reserves of banks, which should enable higher lending. Reduce interest rates on bonds which should help investment. In theory, expansionary monetary policy should cause higher economic growth and lower unemployment. It will also cause a higher rate of inflation. To some extent, the expansionary monetary policy of 2008, helped economic recovery. But, the recovery was weaker than expected showing limitations of monetary policy. Cutting interest rates isn’t guaranteed to cause a strong economic recovery. Expansionary monetary policy may fail under certain conditions. If confidence is very low, then people may not want to invest or spend, despite lower interest rates. In a credit crunch, banks may not have funds to lend, therefore although the Central Bank cuts base rates, it is still difficult to get a loan from a bank. Commercial banks may not pass the base rate cut on. In the Credit crunch, banks standard variable rate (SVR) didn’t fall as much as the base rate. 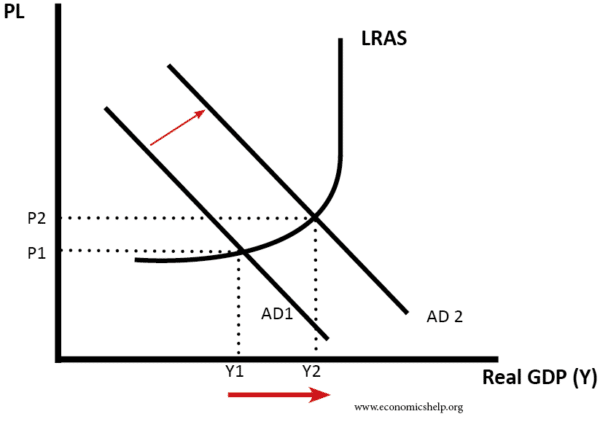 It depends on other components of aggregate demand. Expansionary monetary policy may boost consumer spending, however, if we are in a global recession, then there may be a strong fall in exports which outweighs the improvement in consumer spending. Time Lags. It can take up to 18 months for interest rate cuts to increase spending. For example, people may have a two-year fixed rate mortgage. Therefore, they only see the impact of the rate cut when they remortgage. Did Expansionary Monetary Policy of 2008 Work? The recession of 2008-2009 was very deep. The UK was hard hit by the credit crunch and knock to the financial sector. 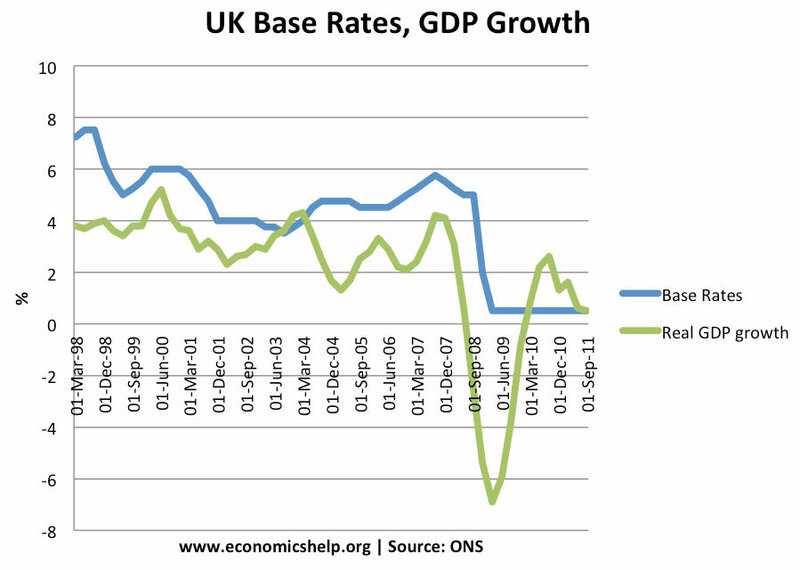 Despite interest rate cut and £200bn of quantitative easing, the economy was quite slow to recover. In 2011, this weak recovery petered out. Helicopter money drop – giving cash directly to consumers to encourage spending. Fiscal tightening has involved cut backs in public sector spending. Public sector spending is added into GDP at cost. If the value of marginal spending is less than cost then GDP (in real terms) will be artificially inflated by the accounting method. If that is so, then In order to re-allocate resources to more productive uses it will be necessary to reduce public sector spending…that will reduce GDP (but by more the the loss of output value). It will mean resources are idle but eventually the economy will (I hope) use the resources freed up more productively. That may be a slow process; the state of the economy is not helpful and many of the unemployed will be in areas with poor short/medium term prospects.